-=- Full "Retro Mortis" Series Article Index -=- Retro Mortis - RTS (Part 1) - It was found in a Desert... Retro Mortis - RTS (Part 2) - Then a Blizzard came... Retro Mortis - RTS (Part 3) - Forged in Steel... Retro Mortis - RTS (Part 4) - A New Hope? Greetings, While not mandatory, it would be advisable to have read the first part of this article before proceeding. During my last article, I've entertained that Dune II was the original precursor of the RTS genre, and have argued that it had led to a "conflict" that opposed Westwood Studios (Now defunct, formerly under EA leadership) and Blizzard Entertainment (now part of Activision Blizzard) from 1992 to 1998. 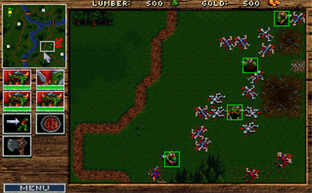 The fierce competition during these years helped shape what would become of the modern RTS. I thought it only fitting to take a look at Blizzard's response to Westood and see where things went from there. Please note that without Patrick Wyatt's invaluable recollection, this article would not have been made possible. It removes the peasant from the task it was performing: this is a cost of option as the player is accepting that the ongoing labor will no longer result in resources being acquired. Since the unit is immobilized for a certain duration, the effect can be quite dire. It consumes resources based on the structure cost. This is another cost of option as these resources cannot be used elsewhere from here on. It provides the player with a new structure (when construction is completed). Depending on what that structure is, it can help the player economically or militarily, but generally will require further investments. The building generally provides further cost of option (building a footman? at what cost?). The complexity of these units, and their relatively inefficient collection rate (compared to Dune 2) insured that players' armies would now have a significant portion of "civilians" (peasants/peons), which in turn introduced a higher level of vulnerability but also some redundancy. Unlike Dune II, where the base economic unit was armored, and focused, peasants are extremely frail and can be everywhere (and often need to be scattered). The loss of a peasant, though not as threatening as an harvester, was much more common. While the Dune II harvester could be escorted by big guns, the peasants cannot be escorted individually, instead, peasants need to be thought of as "supply lines" which we'll discuss below. The concept of complex economic units was upheld and refined through various Blizzard games but also many others going so far as to put a lot more emphasis on these units in games like Supreme Commander. *** In Warcraft: Orcs and Humans, resources are a physical entity which adds tactical depth. For example, trees also act as collisions which means that players need to be particularly careful about where they get their wood. Opening their flank in the early game before proper forces are made can lead to unwanted encounters. Wood thus acts as a natural protection barrier which thins out as one's base grows, but it still requires proper management to avoid a few obvious pitfalls. Likewise, proper harvesting of wood around an enemy base may reveal a particularly "weak spot" to invade from, so it is not uncommon to employ peasants to cut lumbers nearby the enemy base to provide more opportunities. Mines, on the other hand, are extremely focused. They represent a narrow object on the map that needs to be controlled at all costs. Securing a distant mine becomes a critical objective as the mines are finite in nature: whatever gold your opponent gets you won't be able to get. Furthermore, mines require peasants to harvest and return home without any "proxy" base to gather from. This results in rather long supply lines that need to be defended from enemy incursions. As a general rule of thumb, the further the mine, the harder it is to defend that supply train, and the more casualties the player will register. That's what happens when you fail to defend your supply lines... Several series have made good use of complex resources. For example, the Age of Empire series retained the "trees" aspect as most resources occupy physical space. The gold mine system was also refined in various ways, namely by Starcraft which added the concept that a focused resource should require a dedicated investment (refineries need to be built upon Vespene Geysers in order to be controlled). An often forgotten mechanic from Warcraft: Orcs and Humans that was not present in either sequels was the inclusion of "roads". These were mandatory to construct buildings and expand the base. In a way, they played the same role as energy, minus its vulnerability. One would have to pay good money to have roads established. This emphasized the need to keep a closed base (use as few roads a possible given the cost). In a way, roads are the children of the concrete slab in Dune II. The slabs were initially established to insure buildings would be sturdy, but ultimately, it was a means to build proxy bases cheaply (without the use of a MCV). Unfortunately, the roads pale in comparison to the slabs, and did not add much in terms of gameplay. What it did however is provide a sense of community and strong lore: the players are building encampments, not just buildings here and there. Though the implementation was relatively poor, it was found to be lacking in later installments. Roads, building communities since 1994! A number of RTS games with a bit more focus on city building have used the roads to great effect afterwards by merely assessing the UX aspect. Having the ability to drag in order to build more than one road every 3 clicks turned out to greatly diminish the negative frustrations associated with road building, and adding a speed boost on units that walked over roads gave it a gameplay purpose. It is unclear why this was truly added to Warcraft: Orcs and Humans (perhaps playtesting revealed the dangers of "proxy barracks"?) but though its implementation suffered, it remains one of the most under-utilized mechanic in common RTS. Most games that have employed them had a direct link with Roman lore (roads were critical to their multiple campaigns) and I remain perplexed that logistics are not playing a more important role in modern RTS. That being said, its original potential was probably overshadowed by poor UX implementation and lack of tangible purpose: the roads were, essentially, a pain to build, and did not provide much advantage beyond cosmetics. While Dune II sported a flamboyant limit on building construction, Warcraft: Orcs and Humans decided to put emphasis on units. Dune II had a loose text message to determine that the max unit count for the entire game had been reached which basically pooled all in-game units into a zero-sum game: you would have to kill units if you were to build more of them. This archaic form of handling unit capacity in games was around for a fair bit of time. For example, the turn-based strategy VGA Planets originally had the same approach: there is a maximum of 500 units in the game, no matter what. There comes a point where the max is reached, and the game handles it in a different way (in VGA Planets, it uses a system of points, which is mostly influenced by the amount of units you destroy, to determine who gets to build units when a "slot" frees up). Dune II was simplistic: whenever a unit would get destroyed, any unit currently "ready to deploy" could fill that slot, but the algorithm that determined which was arbitrary. Warcraft fixed this design issue by implementing a "by faction" cap. Assuming the maximum amount of units any game could have was, say, 100, this was split across both factions (50 for orcs, 50 for humans). In Warcraft: Orcs and Humans, each "farm" building provides a few units of food (4 if I remember correctly) which means you can create 4 units for each farm. Likewise, your army can never be larger than 4 times the amount of farms you have, or larger than your ultimate faction capacity (half of the game's units). You can, technically, construct more farms than your actual cap, but they will only serve as redundancy in case other farms get destroyed. 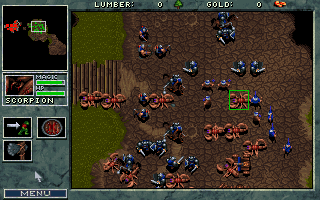 What Warcraft recognized is a flaw in Dune II's (and many other games of its time) design: because base construction was limited, but not unit construction, it could lead to very aggressive build-ups. Since Warcraft insisted on competitive play, they couldn't allow it, and farms were a means to favor the defender: Assuming both factions always have the same amount of farms, the faction with the fastest reinforcements will be the one closest to the fight, de facto: the defender. This ensured that no amount of early aggressiveness could fully annihilate an opponent in the early game (unlike the "4pool" in Starcraft for example). Also, since all units consumed exactly one "food", players were encouraged to build their tech tree and get the "best units" to fill these slots as quickly as possible. Having a fully capped army of footmen was not desirable when facing off against several raiders (orc knights). The food system, however, left base growth rampant. Though limited by the construction of roads, a base could freely expand limitlessly. Food was also very abstract when compared to energy. It was "just a number" and a very static resource. It worked well in its own right, but did not provide much depth. In many ways, food was not necessarily the best solution, but it was certainly the simplest. It allowed to handle several of the design flaws of the original Dune which simply had no means to handle unit capacity properly, and prevented early rush tactics from being too efficient. A quick aside here on the feature that "almost was" (as was recently revealed through Patrick Wyatt's blog): farms were originally meant to be part of a drastically more complex approach to unit development which would've resulted in peasants being "spawned" from farms over time, and then trained at the barracks into military units or used as is as economic units. In what he calls a "design coup", the concept was drastically simplified into this abstract concept. One can't help but wonder what might have happened should the original system had been implemented. 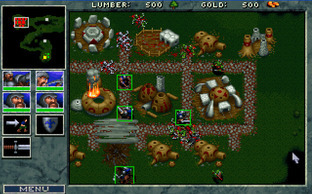 This barebone "Food System" has been used extensively by the Warcraft and Starcraft franchises, but also in other games such as the Warhammer series. It represents a very abstract means to achieve growth limitation and regulate army sizes. Though somewhat mainstream nowadays, it is important to note that it was found accidentally as a means to simplify an existing design that was deemed too complex at the time. It feels it has become the defacto common denominator of the RTS genre, though that may be a questionable status. The Orcs can sacrifice half the life of a unit to make them temporarily invincible (tanks). The Humans can use "healing" which is particularly helpful economically as it allows to maximize the use of "surviving units" and give an extra boost to forwards in the fray. The Humans can use "invisibility" which allows them to hide units so long as they don't attack and allow them deep into enemy lines. All things considered, orcs and humans play much more alike than the different factions in Dune II, but because they are aesthetically different, it is easy to fall prey to this ruse and choose sides. What Blizzard brought forth with this installment is that it was equally important to support faction identity with pieces of lore and cosmetic overhaul. This is a thought they would build upon when designing their highly-acclaimed Starcraft a few years later. Dune II had a system for upgrades which allowed players to unlock further units in the tech tree, but it never really capitalized on this system. Warcraft: Orcs and Humans built upon it by adding upgrades that would affect units directly. They went so far as to having buildings that would only be used to improve units as a whole (loosely based on the House of IX building in Dune II). From upgrades that would improve units' defenses and attacks up to outright new spells unlocked for spellcasters, these upgrades could easily lead to victory and defeat when misunderstood. They added an economic layer to the game where knowing when to make units more powerful vs creating a new unit was necessary. Because an upgrade's value could be measured by the amount of units it would be applied to, it was possible to min/max this strategy when weighting the upgrade's cost, and a number of players started to understand that it was fertile grounds for very advanced strategies. Borrowing from the Civilization series, the "Skirmish" mode had a random map generator which could potentially result in unlimited replayability. As time would prove however, the value of this random map generator was limited in that it did not necessarily generate "fair and balanced" scenarios. Later installments would use "ladder maps" instead which had undergone serious level design efforts. Patrick Wyatt himself, lead programmer and producer of the game, would say that the feature he's ever been the most proud of was the multi-unit selection created for Warcraft: Orcs and Humans. He could very well be coined with the invention of that feature altogether, which no RTS has shunned ever since. Dune II was simply cumbersome to control, and it called for grouping. Though initially the feature was developed without limitations, some design constraints eventually led to multi-selection affecting only 4 units, thus making the feature much less useful, but nonetheless stellar. Suffice to say this one achievement was to become a staple of the genre. Multi-selection at work. Yet he also created the control groups (using control + numbered key) which would also become yet another staple, allowing players to command specific groups of units to improve the player's grip on the game. As Patrick puts it, the player's attention is the rarest resource in a RTS, and these additions came a long way to minimize the burden put on their shoulders and allowed them to better interface with the game. One could argue that, aside from multiplayer, Warcraft: Orcs and Humans' greatest legacy was its sheer focus on User Experience, which given the case, was no small feat. Warcraft: Orcs and Humans started a process that several other RTS would refine which I like to call "streamlining". The good about streamlining is that it makes things easier to use and understand, it lowers the barrier to entry and minimizes the amount of fore-knowledge one has to have in order to learn and play the game. In most cases, this is desirable as it effectively allows to do more with less. The con with streamlining is that it sometimes eliminate depth. This often occurs when features were not implemented properly. With new installments, designers look at what worked and what didn't work and they axe features that didn't work without stopping at "why" they did not work. While this undeniably improves the quality of each subsequent installment it can also kill under-developed ideas that might have truly improved the game significantly. *Warcraft: Orcs and Humans removed the concept of mercenary units which was present in Dune II's starport (and would later be re-discovered by Ground Control). It removed energy (though that's one system Westwood would not let rot). *It gave up on a lot of the subtleties of landscaping. *It simplified (and almost removed) faction assymetry. *It greatly simplified the campaign map. It made the minimap visible de-facto (without the need of a specific building). It reduced the amount of units per faction from 13 to 7-8. It reduced the amount of buildings from 18 to 8. Many of these decisions were for the best as it reduced unecessary complexity and resulted in a better management of "depth", but a few inevitably resulted in the loss of mechanics that could've been expanded instead. (I've put an asterisk next to the ones I humbly believe would've been worth revisiting). Some of these, such as the need for more assymetry, resurfaced years later with resouding success (Starcraft, for example). On the one hand, it brought the RTS genre to the then rising multiplayer scene, forever associating RTS with PvP competition, and implementing the user interface tools to support that experience (multi-selection, control groups). Warcraft: Orcs and Humans is not an exercise of originality, it's an example of execution. Given the risk associated with making this game PvP, the developers chose to stick with simpler designs to create a new dimension: competitive gameplay. In many ways, this streamlined experience is also largely responsible for establishing the RTS as a genre. Had the game explored many new features, people might have missed how "alike" the core mechanics were and never made any subsequent installments, but Warcraft: Orcs and Humans insured that Westood, Blizzard (and others) would duke it out to figure out who could come up with the best game in this vein. I might have tried too hard to make that point clear indeed. I'll revisit shortly, I have a few quirks I'd like to fix in this one and the first part as well. I like that it gets to public eyes this early however: gives me a lot of insight about what people think of it. Orcs and Humans was one of the first games I played compulsively. I still remember how I bought a used copy off of my swim class instructor when I was probably eight or nine, haha. They are, but that was probably not the case back then. This will actually get covered in part 3 which will include more than one game (namely Warcraft 2, which changed a lot for the multiplayer scene). But this part will take a while to put together: I still have a few quirks I want to fix with Part 1 and 2. I'll confess that Orcs and Humans is in a very "special place" for me as well. It was the first real-time multiplayer game I've played (using modem with some of my neighbors) and it really changed a lot for me personally. Why does the picture show WC1, 2 & 3 when the article is only about the first game? Will we get an article about WC2 because that game holds a special place in my heart, it was almost perfect (for the time)? Originally, the article was to consist of Warcraft: Orcs and Humans, Warcraft: Tides of Darkness and possibly hint at Warcraft III, but I ended up with too much content to fit everything in. Still, I felt it was a nice gesture to display them as a series, given that this is the first installment that led to have several other RTS games based around it. Part 3 will gloss over Warcraft II, but it won't be centered exclusively around it. There is a key concept that I was to discuss more in-depth which became quite apparent in Warcraft II and is possible the "only" true difference it has with Warcraft I (more on that in part 3). You use the Zergs in Starcraft. under: Logistics: Roads, established is misspelled. Maybe an addition to Unit selection could be hot keys? I hope the Age of Empires series gets some love in a later part :) I, for one, always preferred those. Though in a way, you can sort of make the Age of Empires is to warcraft and particularly starcraft what battlefield is to CoD... Good games for different types of players. So is C&C next? I forget the order of things. Looking forward to TA being discussed, that was a biggie. Nice catch: fixed the established typo, thanks! "Yet he also created the control groups (using control + numbered key) which would also become yet another staple, allowing players to command specific groups of units to improve the player's grip on the game." But I agree that there were other hotkeys. I'd have to double check my version of Dune II for this though (I can't remember if "A" would trigger the attack command). I hope the Age of Empires series gets some love in a later part I, for one, always preferred those. Though in a way, you can sort of make the Age of Empires is to warcraft and particularly starcraft what battlefield is to CoD... Good games for different types of players. AoE was a very interesting series, but if you stop to think about it for a bit, it didn't have a lot of unique features for a title made in 1997. Sure, there were more resources, but Warcraft II beat that by 2 years when it introduced "oil". You could say AoE borrowed a lot of ideas, and made something good with it, but for the most part, it is far from revolutionary. Dune II and Warcraft: Orcs and Humans were giants and each of them deserved a full article, but the coming parts won't be exclusively about one game. A lot of the C&C mechanics were already present in Dune II, so I'll definitely cover the C&C series, but swiftly. TA although branded as a C&C breaks much of the mold, and isn't an RTS, it's a light browser game that is just set in the C&C Tiberium universe by my reckoning. Total Annihilation not Tiberium Alliances. After that it's been more of the same really, just variations on a theme. Even StarCraft didn't really do anything new, they just did it really well. That, alone, is worth mentioning Starcraft as one of the leading games that brought actual changes to the RTS genre imo. It was very hard for subsequent titles not to have fullscale assymetry (obviously Warcraft III, but also games such as Warhammer 40k which were clearly influenced by that decision). Starcraft's other very important addition is not just good execution, but very keen sense of balancing (and long-term patching to support this). Starcraft would not have become an e-sport otherwise (another key factor in Starcraft being a game changer). All of this balancing was even probably required because of their decision to go fullscale asymmetric. In many ways, I strongly feel that Starcraft brought a lot more to the RTS design history in terms of changes than titles such as Age of Empires. Where I believe you are right however, is that 1998 seems to have crystallized most of the RTS as a mold with preset rules (aside from a few core additions such as Warhammer 40k: Dawn of War which introduced a new economy mechanic).